Ideal for situations where rugged, reliable communications are required. This minute over-the-ear communication cord set provides clear, reliable sound to the covert earpiece. UltraLite is recommended for General Policing, Security, Emergency Response Teams, light industrial applications, and anywhere dependable response is necessary between communicators. Connects with either a 2.5mm or 3.5mm right angle jack into a speaker microphone or radio output adapter. 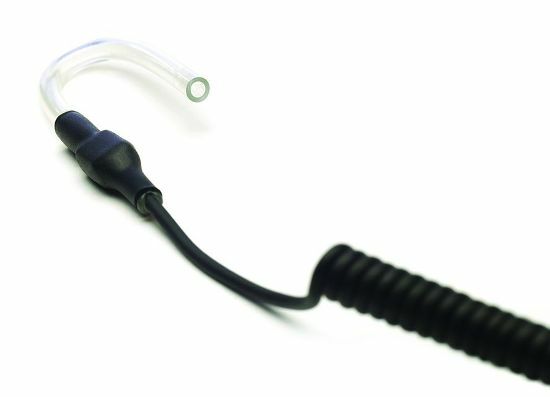 Uses either a CPE Filtered Covert or the Convertible- Y Vented earpiece. Length 22″ relaxed and 32″ extended. The dB Com Is an excellent product to take radio communication directly to the ear. This minute over-the-ear communication cord set provides clear, reliable sound. It optimizes discretion for surveillance while maximizing clarity. Ideal for moderate noise situations where rugged, reliable communications are required. UltraLite is highly recommended for General Policing, Security, Emergency Response Teams, light industrial applications, and anywhere dependable response is necessary between communicators. Connects with either a 2.5mm or 3.5mm right angle jack into a speaker microphone or radio output jack. Uses either a Filtered Covert or the Convertible-Y Vented earpiece below. Length 22″ relaxed and 32″ extended. Moderate noise is noise below 100dB. dB Blockers™, dB Com and dB Life are much less expensive to use than disposable earplugs or muffs. You can save up to 60% over 5 years on a program when an entire facility is fit. The cost per month for dB Blockers™ is lower because you can wear them for 5 years. Ask us to show you how dB Blockers™ can be a cost effective solution for your hearing protection needs.